Even as activity explodes around customer relationship management, our Enterprise Advisor says the CRM acronym has become meaningless. Businesses that offer poor search features -- or none at all -- may be missing out on more than they think. Data volume continues to grow at nearly 40% to 50% each year, making back up of mission critical data very difficult. For any organization looking to manage data growth, improve reliability, and speed data recovery, continuous data protection provides the avenue to address the challenges in a method that will improve overall data protection without weighing down IT with costly solutions. This paper discusses recovery to virtual computer environments, hardware migration strategies, hardware repurposing for optimal resource utilization, meeting recovery time objectives, and increasing disaster tolerance. From resilience against threats to efficient restoration of normal operations, Symantec can help keep your business up, running, and growingno matter what happens. Symantec Backup Exec and Symantec LiveState Recovery allow rapid and easy backup and recovery of virtually any Windows data and Windows system.  Will SiteAdvisor.com Ban Your Domain? Wireless technology continues to make great inroads into networks. But IT pros still must contend with a number of issues such as security, access and integration. Whitepaper: Sun StorEdge 5210/5310 NAS Home Directory Consolidation. Learn how to enable storage & data consolidation while simplifying the task of providing home directories with its automated facilities. Workers! If your office space sounds like the inside of a wind tunnel from the incessant hum of all the PCs surrounding you, lend me your ears. A small manufacturing company recently started shipping a new kind of PC case that emits almost no audible noise whatsoever. Its components stay cool without the need for fans of any kind. To research this technology, I flew to Los Angeles to interview executives of Zalman USA, the American headquarters of the company that makes the new case. I also visited a computer store in a suburb of Portland, Ore., Cool Tech PC (endpcnoise.com), which Zalman officials confirmed is the largest U.S. reseller of their virtually silent cases. If PCs are the noisiest things in your office, this new enclosure may save both your hearing and your sanity. First, we need to understand a little bit of history. Offices have always had sources of distracting noise. Besides the age-old mutters and shouts of employees and bosses, workspaces until a few years ago echoed with typewriters clattering away. But, as PCs have spread widely throughout offices -- and their components have become faster and hotter -- their ever-louder cooling fans have become an irritating drone. This is not just a problem in hushed executive suites and other more-or-less quiet offices. Anyone who tries to add an ordinary PC to a multimedia entertainment center finds that its fan noise often drowns out the movie that's on-screen. Office productivity can also suffer. Scientists from Cornell University recently reported the results of a study in which they assigned clerical workers at random to a quiet office or one with low-intensity background noise. The workers who were exposed to the noise made 40 percent fewer attempts to complete a mind-bending puzzle and made half as many ergonomic adjustments to their workstations. Professor Gary Evans, leader of the study, said low-level office noise "leads to less flexibility in considering alternatives during decision-making." As PCs have become louder and louder, an after-market has grown for quieter fans. Zalman Tech Co., a Korea-based manufacturer named one of the 200 fastest developing Asia-Pacific companies by consulting firm Deloitte Touche Tohmatsu, has served this demand by producing copper heat sinks and relatively quiet blowers that computer users can install to reduce the roar. Zalman's engineers, however, wondered whether it would be possible to design a PC that would be completely, absolutely silent. The result, which first went on sale in 2004, was a case called the TNN 500AF (photo 1). The acronym stands for Totally No Noise. The case cools hot components -- such as the CPU, video chip, power supply, and Northbridge motherboard interface -- by affixing large copper heat sinks to them. These heat sinks, in turn, are connected directly to the exterior of the case. All four sides of the case are made of thick, aluminum walls. One-inch deep, extruded fins on two sides wick the heat away. All this metal, however, makes the 500AF seem more like an armored tank than a PC case. The enclosure alone, before adding a motherboard and disk drives, weighs more than 57 pounds (26kg). And the cost would give anyone sticker shock: Cool Tech PC sells the case by itself for $1,180 USD, ten times the price of an ordinary sheet-metal box. Once you've picked yourself up off the floor from hearing the price, however, you'll hear something else: nothing. The 500AF does, in fact, make no noise. If you put your ear right up to it, the only sound apparent is the barely audible whirr of a hard disk or CD-ROM drive, if one happens to be spinning at that moment. Partly due to the cost, the 500AF never became a big seller. Yu How Low, product specialist for Zalman USA, says the largest order he's personally aware of was from Stanford University's Center for Computer Research in Music & Acoustics, which he said purchased 40 units to eliminate PC noise. 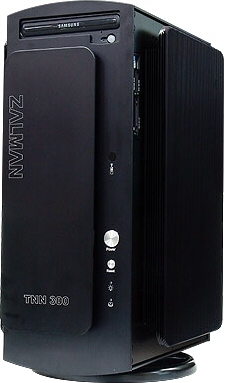 Going back to the drawing board, Zalman announced in January a much smaller and relatively cheaper model called the TNN 300 (photo 2). 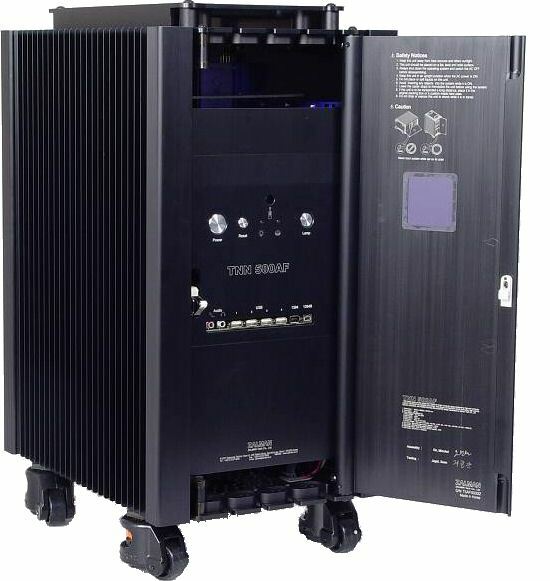 This unit stands only as tall as an ordinary mini-tower PC and accommodates any microATX motherboard, which is a widely used design. Instead of the 500AF's deep fins, the 300 is surrounded on all four sides by thin aluminum radiating panels. These are sufficient to cool the interior components while, like the 500AF, allowing the entire PC to remain totally silent. There are no moving parts to make noise, other than disk drives. The 300 permits only one externally accessible CD/DVD drive or similar component, plus two internal drives. But this much storage should be adequate for most end users. The 300 model is no lightweight, but it does come in at much less than the 500AF's weight and price: 32 lbs. and $750 street. To investigate this alternative to fan noise, I purchased a TNN 300 -- fully loaded with a fast Athlon 64 processor and dual-DVI graphics board -- for testing in my own environment. I'll fill you in next week on what I found. I reported on Nov. 29, 2005, about Writely and other online word-processing services that allow users to edit documents collaboratively. Upstartle LLC, the tiny, 4-employee company behind Writely, was acquired by Google last week, according to statements posted by Upstartle and the search engine. Terms were not disclosed. The Writely service, which has been free since its inception last August, was immediately closed to new users. Speculation is widespread that Google plans to re-introduce the browser-based word processor as an online competitor to Microsoft Word. Brian Livingston is the editor of WindowsSecrets.com and the coauthor of "Windows Me Secrets" and nine other books. Send story ideas to him via his contact page. To subscribe free and receive Executive Tech via e-mail, visit our signup page. Copyright 2005-2006 Jupitermedia Corporation All Rights Reserved.